Here's the whole board just for reference. Up to White 9 seems joseki but then White 10 feels like an overplay. The most important thing about the whole board in the next few diagrams is White 4, which makes the ladders in the lower right favorable for White. I felt good, like I was controlling the fight from the beginning. The whole time I was really aiming at the cut at a. This seems like a favorable position to me. I got a fair chunk of the corner and a wall facing my lower left hoshi stone. She got a bit of territory and but her wall is facing my upper right hoshi stone. But I can't help the feeling that something in this fight has not gone quite right. HolIgor: I think that White did too well in this position. They have what they wanted in this corner, i.e. a living group. The possibilities at the bottom is gone, though. But White's influence along the right side increased. What Black gained in addition to the wall is sente because an extension at the bottom is not urgent now and can be very distant. 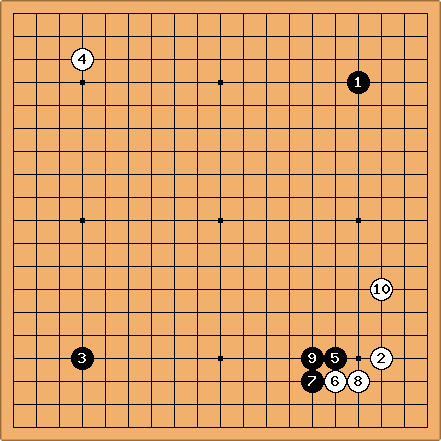 Black can play a large knight's move enclosure in the bottom left corner, for example. Perhaps this makes the variation valid. Joseki. After 10 black plays at the center of bottom side. 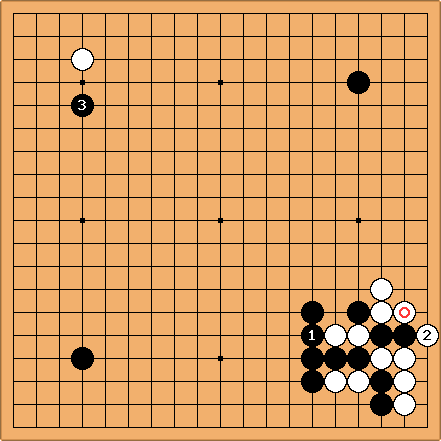 Let me explain how I understand this joseki at my level (IGS 5k*). The white group in the corner is thick. There is no sente move against it. But at the same time White 10 is low, which means that a big territory on the left is unlikely (too many moves to spend and the opponent will not fall sleep at that time). With a move like in the first diagram, the position still remains very slow, but the robustness is gone. There is aji in the position. So, if Black does not hurry to punish it right now, White will alway feel the necessity to come back and protect. The situation reminds me about the famous Sakata-Takagawa game in the Honinbo Challenger's final in 1952. DaveSigaty: I have to take a different view. I think the result in the corner was a disaster for White. 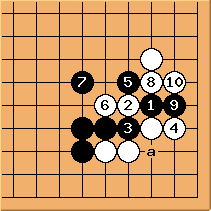 Black hit the weakness of the two-space extension just right. The result with Black building a wall facing his hoshi in the lower left is excellent. I doubt that capturing the two stones at the bottom are worth giving up sente for, however. I think it is better to atari the two other white stones to complete a perfect wall and then play an approach move in the upper left. How does this look? 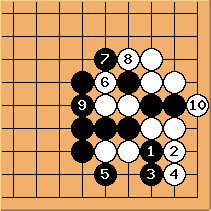 Note that the perfect wall is only possible because White made a mistake by playing the marked stone instead of 2 originally. If 2 had been played, then White could ignore Black 1 in order to play first on the left side. 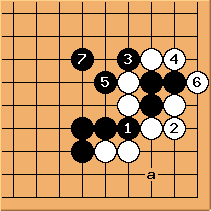 Black could capture two stones but could not prevent White from connecting underneath. 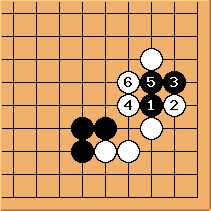 With the game continuation Black 1 threatens 2 cutting White in half. 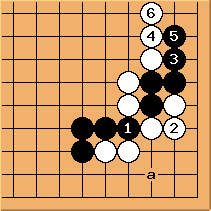 In the game Black gets an extraordinary gift when White uses her sente (received when Black captured two stones at the bottom) to capture one extra black stone while allowing Black to perfect his wall. White should have played on the left side. However, Black's huge wall is going to make it very difficult for White from here on. BillSpight: Black has certainly come out well in the bottom right corner. Let's do a little tewari. First, a couple of sente exchanges. Whiet 3 elsewhere. 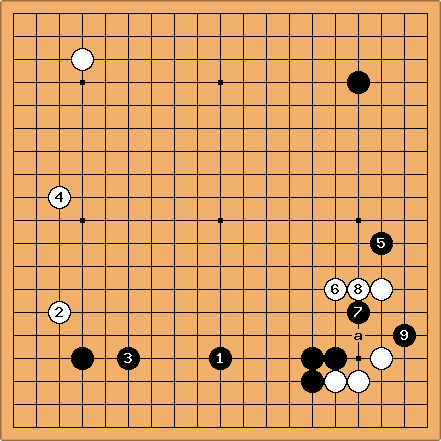 Black has lost three stones on the marked points. This shows the result of some of the pairings. 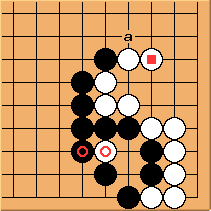 The exchange of the circled stones is bad for White, and White's squared stone would be better off at a. Black 5 attacks White's weakness on a larger scale, making a moyo in the process. A protective move at a, for instance, is just silly. White 6 is more enterprising, but Black still threatens the exchange, Black 7 - Black 9. White has a better response? DaveSigaty: What if Black continues with 3 here? I think that Black tends to find a way to shut White in. Since the upper right corner is a black stone, I think it is not so easy for White? HolIgor: Yesterday, browsing the books in Kinokuniya again, I saw just this diagram. I can't read Japanese but I can look at diagrams :). DaveSigaty: But on the other hand 3 may be an overplay, what happens if White answers 3 more aggressively with 4 and 6 here instead? If Black captures the one stone, then White 4 threatens 5 and White 6 still threatens to descend at 7 in sente so Black 7 seems forced. 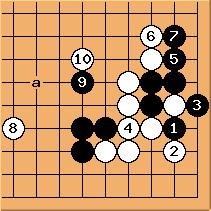 At this point White 8 attacks the three black stones since Black has not yet extended along the bottom from these stones. If Black jumps, White has plays like 10 to protect the cutting point or may choose some other point like a as an alternative. In all likelihood White will also have the chance to play first on the left side and is doing better than in the game? 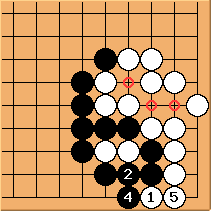 If Black cuts at 1 here, White can either capture three black stones in exchange for the corner by playing 2 at 3 or else keep the corner as shown here. Being cut is not so painful since Black has no recourse except to push along the second line on the right in order to live. 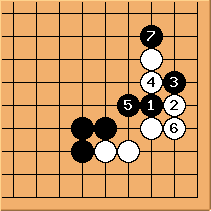 White needs to do nothing except allow Black to push her along; each stone adds to a very nice wall that will have a strong influence on the center at no cost. Hmm... or is White dead in the corner after a black placement at a unless she adds a stone? Sabbaticus: Would it be better for Black to sacrifice the three stones in return for a massive wall?